Usually known as ” The Roof of Africa” , Ethiopia and especially the Simien Mountains are a paradise for hiking offering breathtaking landscapes , majestic flora and fauna endemic . With the most spectacular landscapes of mountain in Africa , the great volcanic plugs Simien or ” chess pieces of the gods ,” there formed some 40 million years ago and eroded over centuries overlook the steep gorges , valleys river and plains. - Cook and logistics ( tents, food , water, cooking equipment ) accompany you on a mule . 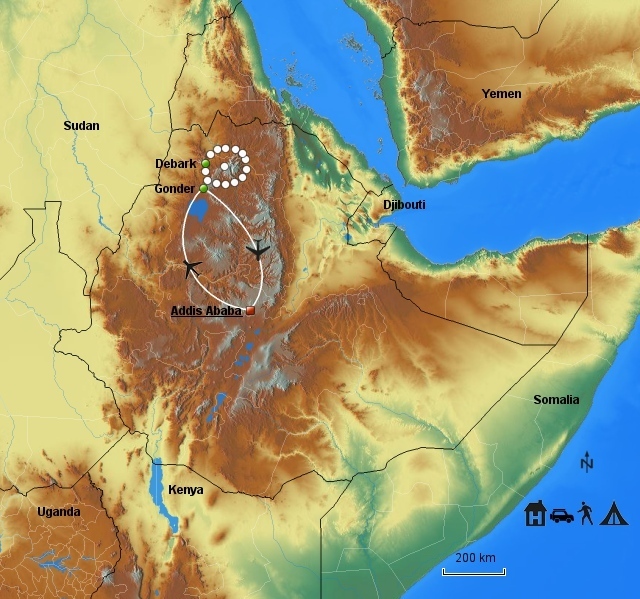 - Discovery of Gondar , the former capital of the ancient kingdom of Abyssinia and its castles . Your 5 day walk will take you through the landscapes covered by deep gorges, jagged caps and striking rock towers . You ‘ll find the Debrak to Sankaber , Chenek , Immet Gogo Geech , Ambiquo Ras Dashen with days 5 to 8 hours of operation. This park is a refuge for many endemic species such as the Gelada baboon , the Walia Ibex , many species of birds and giant lobelia . The park was declared a World Heritage Site by UNESCO in 1974.